Stunning man and woman pair of 14″ ( 35 cm ) papier-mâché shrouded head dolls with ” milliner’s model ” style bodies, having firm leather torsos and upper legs, with long wooden arms with ” spoon ” hands and molded and painted shoes. Although superb in their own right just as dolls, their original elaborate ethnic costumes really set them apart to make them something special. One might assume by the man’s head covering that they could be either Turkish or perhaps from one of the Balkans countries controlled by the Ottoman Empire during the time of the manufacture of these dolls ( late 1840’s – early 1850’s ). The man has the remains of a pencil line mustache, the woman a center part hairstyle with thick braids covering both ears and molded into a tight bum in back. The fine lace headgear of the woman also could denote that of a bride wearing her traditional regional dress. Perhaps the highlight of both costumes are the similar sewn on shoes with turned up toes. Regardless of exact origin of region or country, they are truly remarkable, especially as a pair. US$ 2,975. Impressive 1860’s era glazed porcelain shoulder head with molded and painted features standing 25” ( 64 cm ) tall and mounted to an antique stuffed muslin body with sewn joints at shoulders, hips, and knees, and with brown leather forearms with individually stitched fingers but no separation between them. The hand pressed head is quite heavy and maintains throughout the face and shoulder area a nice pink glaze tint. The cheeks are rosy, the eyelids separately molded with two red highlight lines on the upper, the eyes pale blue with black pupils, and the brows one stroke painted and curved. The hair is black with slight shallow center part with face framed with wavy curls and hair drawn back totally covering the ears into ten vertical curls reaching to the mid neckline in back ( minor typical age-paint wear on a few curl tips ). The dress is antique dark blue and white printed cotton with fine white lace trim at collar and sleeves, and covered in front lower torso with a pale blue linen apron with feather stitching. Undergarments are all antique cotton and/or linen, the stockings black knit cotton, and the shoes two-tone black and beige canvas, antique but not as old as the doll itself. A slightly different model of excellent quality yet still at a price that makes her easily affordable for many….RESERVED. Beautiful and extremely rare 20” ( 51cm ) German parian shoulder head doll representing the famous portrait and/or portrayal of “ Princess Eugenie “- one might say “ Yes, perhaps rare but I have seen her before “. At first glance one might assume this to be true, but upon close examination and comparison this particular model has unique differences in features and proportions. 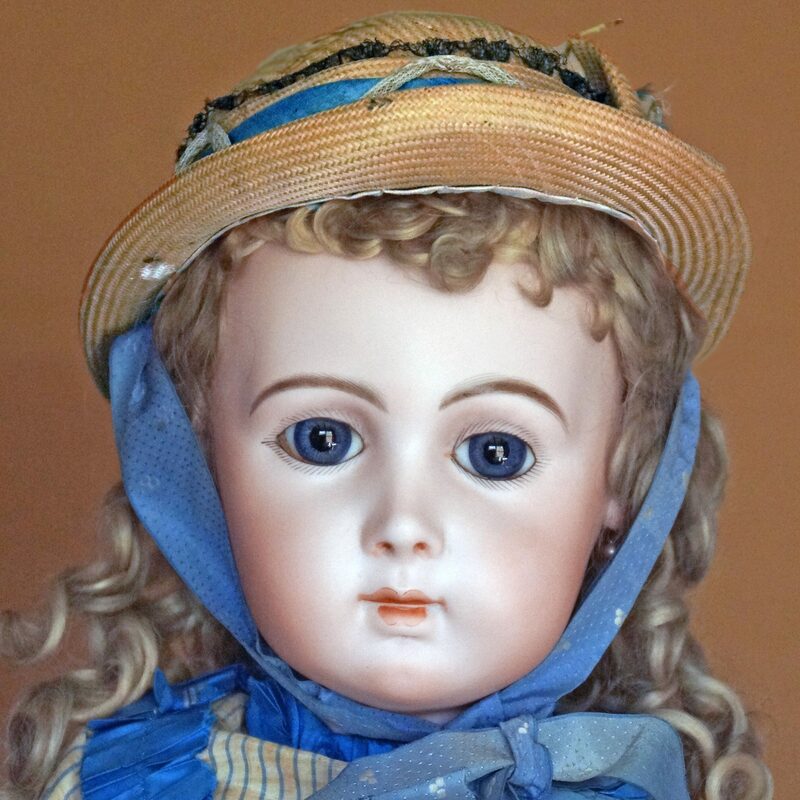 As of the date of this posting of this doll to the site one will notice we have another “Princess Eugenie “ offered for sale and barely an inch taller overall, if that. As nice as the other one is, she is the one more commonly found and the similarities the differences are as such- although both have blond molded and painted hair with deep comb marks, and blue colored snood covering the hair in back, and a pink and white luster trimmed headband going across the head on top in front and securing the snood, this model has a less elongated face, a slightly younger more defined face, a much deeper shoulder plate, and a short cluster of vertical curls extending below the bottom of the the snood in back, below the neckline onto the top of the shoulders. These differences may seem minor but side by side comparisons compel one to realize that these are two separate renditions of the same image probably manufactured at the same time by two separate doll factories. This doll is on an antique stuffed muslin body with white leather arms with separately stitched fingers ( somewhat frail ). Clothing consisting of an antique white cotton gauze linen dress with pale lavender silk ribbon inserts and fine lace trim, antique white cotton and linen multi-layer underclothing and pink knit socks, and antique black canvas shoes with low heals and buckles, very old, but unlikely quite as old as the doll. A rare and unexpected find- superior in quality and presentation! Although not mandated as a requirement for purchase, it would be wonderful for her to be sold with her slightly more mature-looking sister, and would be an excellent “study example “ for a lecture or doll club meeting, exhibition, or competition ( assuming such a category existed )! US$ 1,350. Stunning, elegant, and with a regal flair is this 20″ ( 51cm ) parian shoulder head doll known to collectors as ” Princess Eugenie “. The nearly white head has all molded and painted features with blue painted eyes, with black eyeliner on upper lid, tiny lashes on both, a closed mouth with the hint of a smile, blond molded and painted hair with the distinctive hair net snood covering the hair in back with a pink lustre and gold lustre trim headband holding all in place with a large decorated white feather on the left front, also with lustre highlights. She is on an antique all white leather firmly stuffed body with gusset joints at elbows, hips, and knees, and individually stitched fingers . The costume is all antique with a white cotton blouse, a beautiful ” dotted Swiss” white cotton and fine lace skirt, a cream silk top with braid trim at neckline, sleeve openings, and at the base. Undergarments are antique, as are superb antique black leather flat soled shoes. She also retains a bracelet on left wrist. One could say that this doll is a forerunner to what was to be later known as a ” French Fashion “ and understandably so!……..USS 1,350.